Features: Stainless Steel. Tritium Front Night Sight. Waterproof Case. 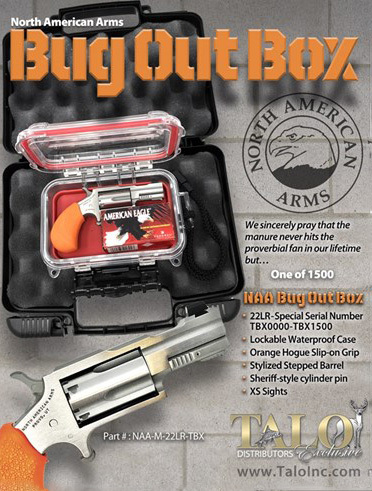 The NAA TALO Exclusive Bug Out Box is specifically assembled for emergency preparedness. 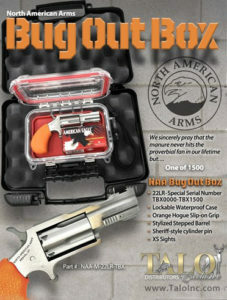 It contains a unique NAA .22 LR Mini Revolver that is a diminutive pistol which delivers a bite much worse than its bark! This pistol includes the time tested characteristics that are incorporated in all NAA mini revolvers. It can be used with all popular .22 Long Rifle ammo, including .22 LR shot shells or ‘snake shot’. These Mini Revolvers can now boast greatly enhanced stability and accuracy for the shooter. This pistol has a lightening cuts to the frame and barrel, with Hogue orange rubber pebble texture grips, a safety notched cylinder and an XS Tritium sight. It comes in a lockable case with a lanyard and enough room for a box of ammo. Sized perfectly for your BOB or Get Home Bag and a perfect fit for a hiking pack, it’s the ideal emergency pistol.